I may have a mild obsession with this dish. I cook it all too often. It's something that goes well with so many different sides, that I thought I would just post the salmon, and let you do whatever side your heart desires! I like to use either Sockeye, or Atlantic salmon. My simple rule of thumb with salmon is- always fresh! Just look at how gorgeous and buttery that piece of salmon looks. Out of ideas for sides? I often make a side of roasted kale or asparagus (olive oil, lemon juice, salt and pepper). 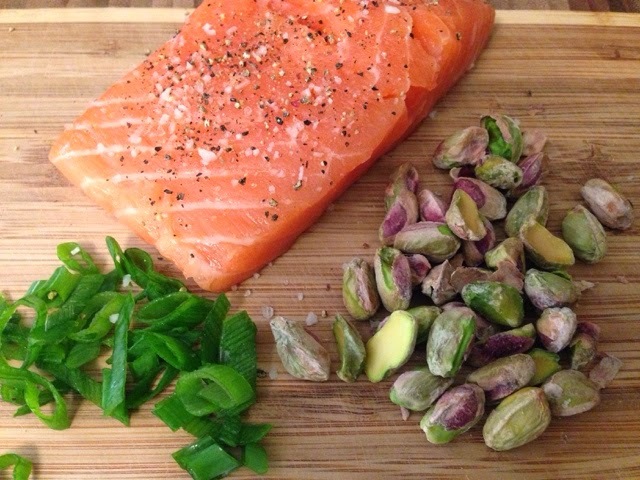 The salmon also goes very well with a simple risotto, or roasted potatoes. I also usually serve it with a Creamy Dill Sauce, which you can find here. Pre-heat your oven to 350 degrees Celcius. 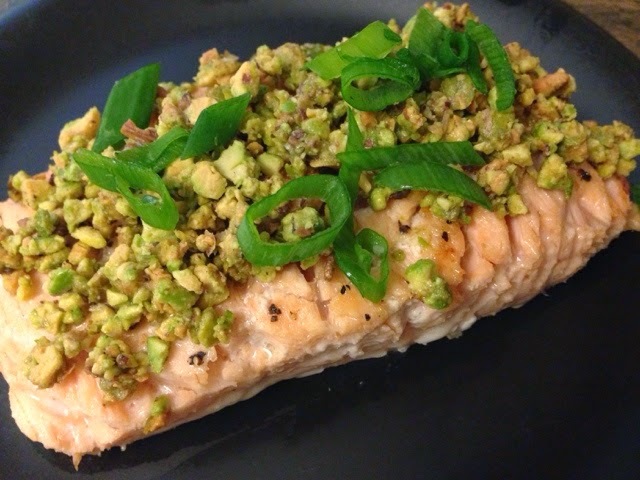 I find it easiest to get the pistachio crust made before I start to cook, as the salmon cooks fast, and you don't want it to overcook while you are making the crust. Having said that, let it stay warm, so the butter doesn't harden. It will be harder to spread if it does. Preheat your oven-safe pan on the stove on med-high heat. Add the oil. It is very important to have the oil and pan nice and hot before putting the salmon in, as this will give the outside a nice crispness and colour to it, without overcooking the inside. Before you put the salmon in the pan, salt and pepper the top of it. Once the pan is good and hot, place both pieces of salmon in the oil, salt + pepper side down. Once you have crusted the salmon, place it on a middle rack in the oven. This part is a matter of preference. I like my salmon cooked medium, other people like theirs well done. I would say leave it in the oven for 4 minutes, and it will be perfect. 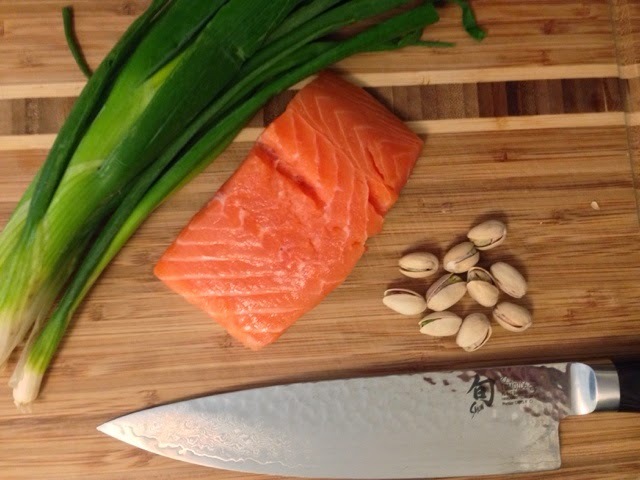 This will vary depending on the thickness/size of your salmon, and how well you want your salmon done. Salmon cooks (and overcooks) very quickly so keep a close eye on it, and don't let it overcook. Best it be underdone and thrown back in the oven, than overdone and dry. Remove from the oven, garnish with green onions, and serve with your favourite side!